Because some of director Jason Reitman’s work tends to be stylistically traditional and classic, he says there might be the assumption that he’s not a visual filmmaker. But seven years as a commercial director tends to make you as visual as the next guy. And make no mistake. He is absolutely specific when it comes to below-the-line elements on his features, and “Up in the Air” was no exception. Early on the director established a department-wide below-the-line arc on the film that everyone on the crew worked toward. The idea was that at the beginning of the film, the audience is meant to see the world through the main character, Ryan Bingham’s eyes and by the end of the movie, they would see what the world looks like for real. By the end of the film, things are being shot with longer lenses, hand-held, with warmer tones. The costumes are sloppier, extras are sloppier, production design is more lived-in. Even the idea of the film’s general setting — airport terminals — reflects this in some way. “The first time we see an airport, it’s beautiful,” Reitman says. “It’s this sweeping shot coming over a group of people as Ryan comes in with this roll-away and the sun’s cutting through from the left. The last time he walks in it’s overcast, long lens, somebody bumps into George (Clooney), there’s a guy mopping the floor in the background. 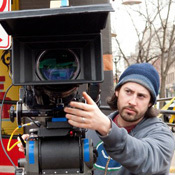 Reitman first met cinematographer Eric Steelberg in high school. Steelberg had an interest in photography at the time and was toying around with the idea of seeking higher education. But after a two-year stint in community college, and as short films and “bottom-of-the-barrel” or “straight-to-DVD” movies kept calling, he decided an education in the workplace was more appropriate. Steelberg also delighted in laserdisc special features, the first home video elements that featured director commentaries. “It was the first way to get the inside scoop on behind-the-scenes,” he says. The lenser first worked with Reitman as a camera assistant on one of his first shorts and maintained the relationship. When Reitman began to transition into features, Steelberg was his guy. Similarly, film editor Dana Glauberman got her start as an assistant on a number of Reitman’s father, Ivan Reitman’s films. First there was “Father’s Day,” then “Six Days Seven Nights.” A young Reitman would come into the editing room with his short films and eventually struck up a friendship with Glauberman, who offered a helping hand to the up-start. With Reitman building a steady professional family around him as a filmmaker, the shorthand kicked in soon enough. “Up in the Air,” with its transparent but meticulous attention to detail, is the current culmination of those relationships and, incidentally, Reitman’s most critically acclaimed effort to date. Even the wardrobe took on a life of its own as Oscar-nominee Danny Glicker set about nailing down the particulars. Indeed, Glicker set about assembling a wardrobe for Ryan Bingham that could fit into a carry-on piece of luggage, striving for as much authenticity as possible. Glicker came to Reitman and actor George Clooney with full blown books dedicated to packing and put together demonstrations on how each item in Ryan’s suitcase would pull double and triple duty, like running shorts doubling as a bathing suit, for instance. And when it came to a wedding sequence later on in the film, Glicker was even more adamant about an attention to realistic detail. “Even though it is a movie, there was a very, very, very serious focus on making sure that each character was absolutely authentic to their place in the story, and the clothes really reflected that. Even though the business world has a lot of rigorous rules, there’s major distinctions even within those rules, and I think one of the greatest examples of that is between Natalie and Alex. “You see two women in the business world who are completely different in the way they present themselves. Natalie is dressing to absolutely try to present everything about a business person that she thinks people will expect of her. She’s conforming to a young business woman just entering the workforce, and she’s trying to use her clothes to strip her identity away, to just be clean and professional and presentable and kind of use the clothes as a form of armor. When it came to shooting the film, Reitman was thorough enough to take still photographs of every angle of a shot, fully concerned with the preparation but also leaving room to improvise if need be. However, nothing was a frivolous include. The film had the same overall production length as “Juno,” but with twice the amount of time for principal photography and half as much time in post-production. Matched with a more robust narrative with more storylines and characters to deal with than Reitman’s prior work, that schedule made for quite the challenge on Glauberman’s side of things. But it was a welcome one, given how much she enjoys being in a dark room finding the best path for a visual narrative. Reitman is quick to sing Glauberman’s praises, and not just for the obvious, surface-level skill that most tend to single out when discussing the editing of the film — like the quick cutting of the airport security sequences. Reitman also says he prefers Glauberman come to the footage as fresh as possible (as in, no visits to the set), because it can detract from the serendipity of spontaneity. That approach just so happens to dovetail with Glauberman’s way of working. Finally, one of the most discussed elements of the film’s cinematography is something Steelberg says he unfortunately can’t accept credit for: the aerial shots that open the film and serve as transitions throughout. It was the result of a separate team that went up to grab the footage, though they encountered some problems along the way as well. Initially there was a periscope-style film camera that was fed into a dome beneath the plane, but the images came out grainy and just didn’t work to Reitman and Steelberg’s liking. Plus, it’s quite simple to get helicopter-level aerial photography, from say 5,000 feet. But to get images from roughly 25,0000 feet and see the “patchwork of America,” as Reitman puts it, the crew had to use a digital camera on the wing of a propeller plane. To get it that high, the pilot had to use oxygen. Then there was the issue of the camera mount, which was designed in such a way as to prevent a 90-degree, angled-down shot. In order to achieve that, the plane had to be tilted into a dive. But the trouble was both worth it, and necessary if the film was going to have the point of view Reitman was going for. There’s a tribute to Amelie in this film. It was probably the only thing I loved about the film. Very good read, made me realize somethings in the film that I definitely noticed but didn’t put it all together.